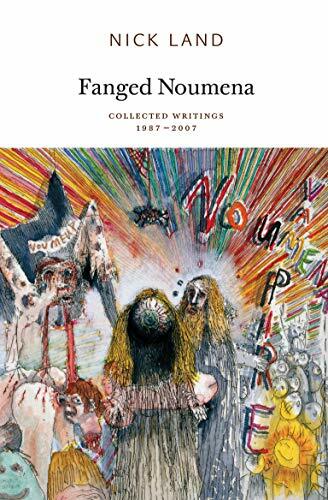 “Fanged Noumena brings together the writings of Nick Land for the first time. During the 1990s Land’s unique philosophical work, variously described as ‘rabid nihilism’, ‘mad black deleuzianism’ and ‘cybergothic’, developed perhaps the only rigorous and culturally-engaged escape route out of the malaise of ‘continental philosophy’ – a route which was implacably blocked by the academy. However, Land’s work has continued to exert an influence, both through the British ‘speculative realist’ philosophers who studied with him, and through the many cultural producers – artists, musicians, filmmakers, bloggers – who have been invigorated by his uncompromising and abrasive philosophical vision. Beginning with Land’s early radical rereadings of Heidegger, Nietzsche, Kant and Bataille, the volume then collects together the papers, talks and articles of the mid-90s – long the subject of rumour and vague legend (including some work which has never previously appeared in print) – in which Land developed his futuristic theory-fiction of cybercapitalism gone amok; and ends with his enigmatic later writings in which Ballardian fictions, poetics, cryptography, anthropology, grammatology and the occult are smeared into unrecognisable hybrids.